While I certainly enjoyed snacking on the foodie goods the L&T people had out (of course, we always hungry press folks had to take handfuls of the See's Peanut Brittle), the brooches caught my eye as a top holiday pick. About six years ago, it seemed like retro-brooches were the must have item of the moment. Judging from L&T and other major department store previews, interest has risen again this season! 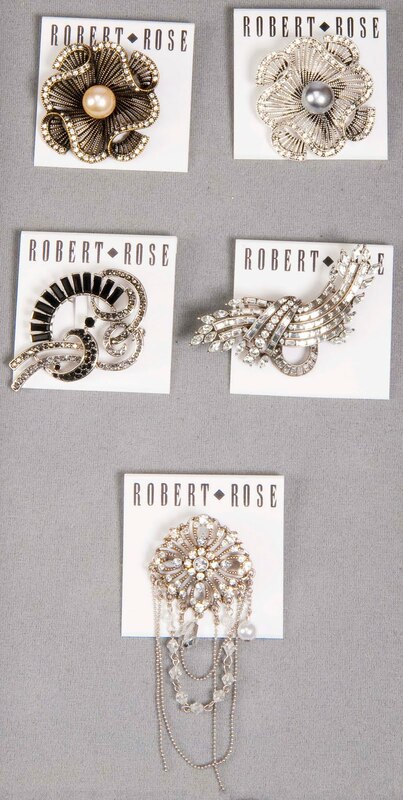 Brooches from Robert Rose and Nadri could easily be something the late Joan Crawford would pin on the lapel of one of her heavily padded suit jackets - Coco Chanel herself would probably be proud of some of the designs! Many of the mannequins dressed in clothing for the fall/winter season were sporting wool caps with a floral motif brooch or two...and every tweed jacket or coat seemed to have a brooch whose crystals picked up its primary colors. 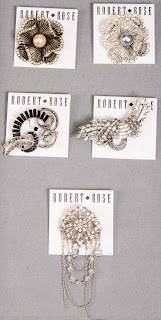 You can see examples of Robert Rose and Nadri items exclusive to L&T's holiday line below [Ed Note: the styles shown on here actually become available on September 29, 2010 and prices range from $32 to $78], and you can bet that the legendary department store will have two to three hundred pins/brooches available to anyone who needs a last minute holiday hostess gift or stocking stuffer! My favorite use of a brooch you ask? Why, to keep that always-falling-off pashmina in its place when it gets chilly or to quickly cover up a spot created by a falling hors d'oeuvre at a cocktail party! 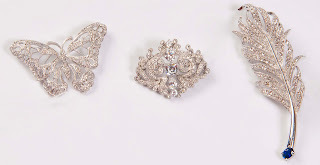 Brooches are not just for royalty or grandma anymore--this particular selection I saw simply rocked--and thanks to L&T for keeping the price points low so these brooches can be enjoyed by all! Sparkly brooches! Excited to see this in stores!